If your microbiome is impaired, even the healthiest diet may not succeed, as your ability to absorb nutrients will be affected. •Microbiome health is crucial for maintaining overall health and wellbeing. •Revolutionary Microbiome Testing now gives you insight into the condition of your own microbiome, and how it can be improved to enhance your overall health and wellbeing. •Kefir producer Chuckling Goat has partnered with Atlas Biomed, developers of the innovative Microbiome Testing Kit. Why is Microbiome Testing Important? Your microbiome is an amalgamation of trillions of living bacteria inside your gut. This living ecosystem inside you determines the health of every aspect of your body: skin, muscle, bone, digestion, immune system and mood. Antibiotics, stress, poor diet and environmental toxins can compromise bacteria inside the microbiome, which in turn can damage your health. Historically, it has been difficult to gain insight into gut health. Now innovative Microbiome Testing, launched by kefir producer Chuckling Goat in partnership with personalised medical technology company Atlas Biomed, offers an understanding of microbiome health, as well as personalised information on how to enhance it. This test generates a Microbiome rating, which discloses how well the gut is coping with its present diet and workload. The test also reveals which vitamins are being properly synthesised, which supplements and foods would be beneficial, how well the gut is processing dietary fibre, the diversity of the microbiome, and the concentration of probiotics and beneficial bacteria within it. Why is my diet not improving my health and how can I change this? The importance of the microbiome has until recent times been greatly underestimated. If your microbiome is impaired, even the healthiest diet may not succeed, as your ability to absorb nutrients will be affected. It's critical to know which foods are right for you. Your microbiome is unique as your fingerprint, and foods and vitamins that are beneficial for one individual may not be for another. The test also detects how effectively the microbiome is protecting the body from diseases such as Crohn’s disease, obesity, and type two diabetes. Shann Nix Jones, founder of the UK’s leading Kefir producer Chucking Goat and three-time Amazon book bestseller, explains why these innovative Microbiome tests are so vitally important in improving and maintaining health. "For so long, we've been struggling with guesswork, when it comes to what's happening inside the gut. To finally have a simple, easy-to-use technology that gives us the evidence-based answers we need to improve gut health is beyond exciting. Chuckling Goat is proud to put this cutting-edge information in the hands of our clients." How does Microbiome Testing work? The Microbiome Testing process is simple, straightforward, and fully supported by the friendly staff at Chuckling Goat. 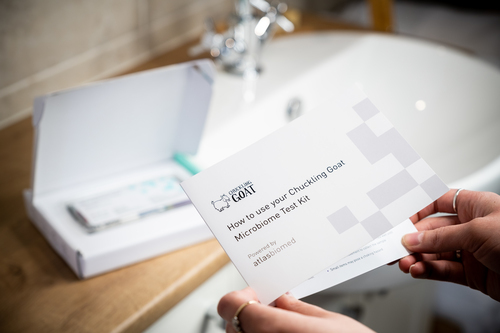 Just place your biosample back into the kit box, seal the prepaid, pre-labelled packaging and drop it in your nearest post box. Your results will take 4-5 weeks to process. When your results are ready, you will be contacted by Chuckling Goat’s qualified nutritionist. During a free, private consultation by phone or skype, the nutritionist will talk you through your results, explain your personalised food and supplement plan, and answer any questions that you might have. You will receive a written copy of your report for your reference. Order your test kit today, www.chucklinggoat.co.uk/product/microbiome-test/. For more questions, ring 01239 654 072 or email info@chucklinggoat.co.uk. This press release was distributed by ResponseSource Press Release Wire on behalf of Kin Communications2 in the following categories: Health, Women's Interest & Beauty, Medical & Pharmaceutical, for more information visit https://pressreleasewire.responsesource.com/about.